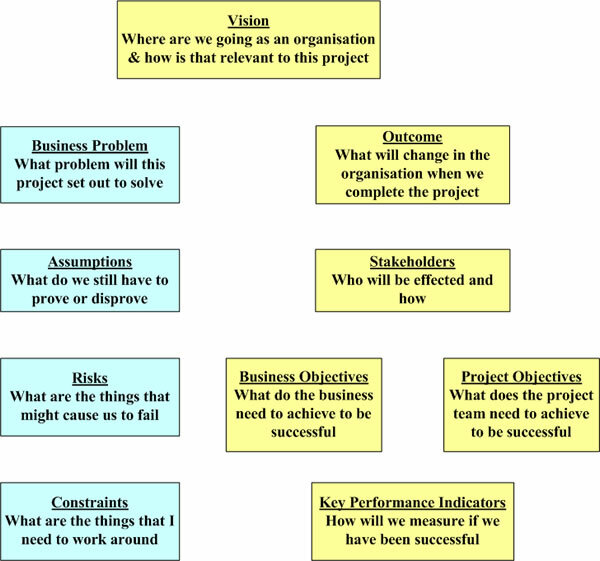 Vision, Business Problem, Outcome, Objectives and all that stuff. It is always tempting to dive in and solve the problem before you understand it. Most IT people are solution oriented. In other words, the first response to hearing about a problem is to develop a solution. If the solution comes to mind before the problem is fully articulated, so much the better! That is not to say being solution oriented is a bad thing. It is a good thing provided we have the patience to fully understand the problem. The following example takes you through the steps you should put in place before starting a project. For the example, we will use a customer tracking system. The vision is a ten thousand foot view of what the new situation will bring. It is not necessarily active in terms of an outcome. It focuses more on how the project will contribute to the bigger picture of where the organisation is going. Think of "Vision" as being the alignment with corporate objectives. Answer the question; � The direction of the company is. (What specific part of that direction is relevant to the project) Example: The company is focusing on providing better customer service. To meet this need we plan to invest in various programs that contribute to this goal. This is sometimes hard to define. In fact often, different people see the problem in different ways. Unless the problem is clearly defined, articulated, documented and understood, there is not much chance of delivering a successful project. The business problem is that we cannot track contact with each customer, which affects our staff - particularly in Sales and Dispatch. The impact of which is that we do not know of problems with orders until it is too late to do anything to resolve the problems. By fixing the business problem, something will change in the organisation. This is the "Outcome". It is not the nuts and bolts of what we deliver. The "Outcome" is the change in the way the business operates. It is at a lower level than the "Vision" in that it contributes to achieving the "Vision". A successful solution will cause all parties to be aware of who has spoken to each customer, what was said and be able to reduce the incidence of no communication on a specific topic, or duplication of communication on a topic. This will result in better communication with customers, and hence a better relationship resulting in increased sales. By identifying who has an interest in the project, and why, we can more clearly see how they will be involved, and what we need to tell them. Obviously when it comes to preparing a communication plan more information will be required. Constraints are the things that restrict our creativity in the project. They stop us doing whatever we like. Constraints are facts of life with which we must live. They are documented to keep us focused on finding solutions that can be developed or implemented. We do not want to waste time looking at options that will never see the light of day. Only one business user will be available from the sales area during June. Risks are a double edged sword. Firstly we need to understand what might cause us to fail, but in doing so, it provides the opportunity to do something about those situations and lessen our chance of failure. It is important to understand risks early in the project because if they are too high, the project might be better not started. What might go wrong, and what will be the effect? The people responsible for entering the data will not see the benefit and this will cause the system to be unreliable and not used. Projects always have a high degree of uncertainty. In order to make any progress, we need to assume things. The reason to document them is twofold. Firstly it allows people to challenge the assumption, and secondly it ensures we don't forget the assumption. The sales file is up to date and we can load information directly into a new system. The objectives for the project should be measurable. It is a given that the first key objective is to achieve the outcome however objectives can also relate to the management of the project. Reduce examples of reported duplicate contact from an average of 10 per day to 2 per day within 3 months of implementation. Reduce customer complaints related to communication from 20 per week to 5 per week. Improve sales to 60% of existing customers by an average of 15% over 12 months beginning January next year. Some projects have 2 KPIs and others have 20. Some are measurable, some are not. As a general rule there should be between 3 and 8 KPIs and they all should be measurable. Very often the KPIs are contained in the outcomes and objectives however not all outcomes and objectives automatically become KPIs. The focus is on the word "Key". Think of "Cause" and "Effect". The "Effect" of improving sales is driven by the "Key" of delivering the project by end December. How will we know the most important outcome and objectives have been met? The KPIs for the project are. 60% of existing customers improve sales by an average 15% over 12 mths. The following diagram shows the hierarchy of understanding a program. In many cases components will be identified and agreed out of sequence. 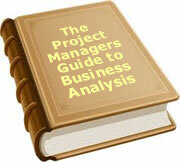 For example, the Business Problem may be the first thing identified within a project. The left hand side are the negatives we need to overcome, and the right hand side are the achievements we expect to come from undertaking the project. Defining each of these terms is not an exercise in filling in forms. It is critical to the success of the project that the organisation is focused on what the project is all about. More importantly, everyone should see the project in the same light. If there are differences, the project will either meet the expectations of some and not others, or be diluted in the delivery. Defining each of these terms is a critical step in understanding what the project is about, and reaching a successful conclusion. To date, 72 people have rated this article. The average rating is 3.67 - Add your rating. Just select a rating and click the button. No other information required.